With an overall closed length of 4 7/8", this gut-hook folder was designed to go everywhere you go. The Camo ergonomic handle has black rubber non-slip inserts for great grip in any conditions. A liner lock keeps the 440C satin stainless steel blade securely locked for the toughest tasks. 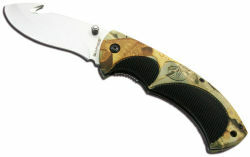 Knife comes with ambidextrous thumb stud and green magnetic-closure nylon carrying case. Our beautifully designed hunting knife is something you've got to take on your next deer hunting trip.